These black ProClick Spines are innovative binding spines from GBC. These black 32-ring spines insert into your 32-hole punched document and snap closed to give a professional look to any presentation. Using these black ProClick spines, pages can be easily added and removed by zipping the spine open with the included zip tool. The black GBC ProClick spines can be used with your existing 3:1 wire system or with a ProClick punch. Size:5/16", 5/8" , or 1/2"
I didn't have the tool to close them, but it was fairly easy to accomplish that task. to open them up or to replace a sheet was easier than the 9mm black Eco-coil. You didn't have to take it completely apart. Use this size for 10 or more pages. Arrived on time, was exactly what I ordered. Will order again. folding the spine in half, then insert on machine the paper goes on easier and the papers stays on. Had to close the zipper by hand, the 1/2" zipper does not work well on the 5/16: zipper. Welcome to MyBinding video. 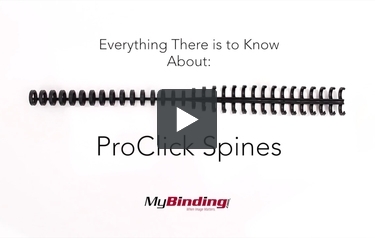 This is everything you need to know about ProClick spines. There are few different sizes, ranging from 5/16" to 5/8". With a larger size, you can fit up to 125 pages into your book. They come in a standard 11" length but there's also a half size, 8.5". A nice thing about this binding is that it lays flat. Not only that but it even lays back to back. The best part is that you can edit it anywhere, with or without the tool. To close it, pinch the end of the tool and swipe. To open it, slide the other end through. There are a few machines out there to do this for you too. They have the 3:1 pitch punch patter, which means there are 32 holes exactly like the 3:1 twin loop wire. You can even use the same punching machine. With all its convenience, it's only sold in a few colors. And that is the ProClick spines. For more demos, reviews and how-to's, go to MyBinding.com. will this spines are shipped to india?. what is the total quantity of spines i receive when i pay 7.39$? Thank you for your question. We do ship internationally. If you put items in your cart and view the cart, you can enter your country and postal code to get the shipping cost. For international orders we only accept PayPal or wire transfer (there is a fee for wire transfers) as payment. For orders paid with PayPal, the order must ship to the shipping address associated with the PayPal account. All prices on the website are in US Dollars, for most accurate and up to date exchange rates please contact your financial institution. Please contact our customer service department directly if you need assistance placing the order and we would be happy to help. The pack that is currently $7.39 is a pack of 10 spines. Will this work with my Proclick Pronto machine? Would these spines work with a comb bind punch? Pro-click spines are designed to work with a 32 hole 3:1 pitch (3 holes per inch) hole pattern. If you need an inexpensive punch you might consider the Proclick P50 which is less than $75. Or if you are set on using your Comb binding machine you might want to consider using zipbind which provides a similar finish with a 19 hole pattern instead of a 32 hole pattern.